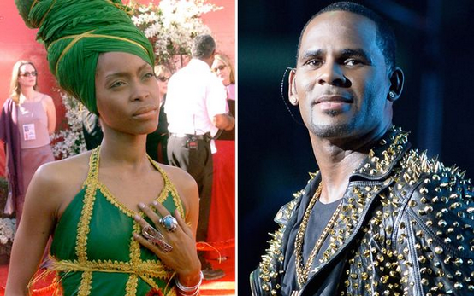 Singer Erykah Badu left several fans in a rage as she is said to have given an impassioned speech "defending" R Kelly during her recent gig. The American singer-songwriter was performing at the Aragon Ballroom in Chicago when she hit out at the international outrage towards the R & B singer, in the wake of Lifetime documentary Surviving R Kelly. One concert goer told the Independent that Erykah suggested the Ignition singer was being treated unfairly by the public, and went on to cryptically state that she "sees all points of view". Another member of the crowd tweeted claiming that she told them to "keep [their] opinion to [themselves]," while a third wrote: "I really want to say how much i loved Erykah Badu’s concert tonight. "But i can’t get over how she tried to justify and defend R. Kelly’s actions and reputation during her set... I’m so disappointed..."
The singer's comments come after she was reportedly asked to appear on the damning Lifetime documentary, but said no. She also caused a stir as she hinted that she "loved" Kelly recently despite accusations from multiple women that he targeted them while under-aged.